"Following some dental work, I was badly affected by the injections I had been given. After a while, I found it impossible to open my mouth wide enough to eat, drink. I had to use a spoon and straw. At that point panic set in and I rang Rachel and explained. Yes she could help me. So we went to her clinic in Crich. Rachel treated the condition with acupuncture using selected pathways down the sides of my face. It was a gentle and painless experience and the condition responded very quickly. One more treatment and my mouth was restored to full movement. What a relief!! Rachel is a remarkable and effective healer in my opinion, but then I am her mum.....Sue Jennings"
Acupuncture is part of an amazing ancient system of medicine using fine needles to stimulate the body's natural self-healing and pain-relieving mechanisms. 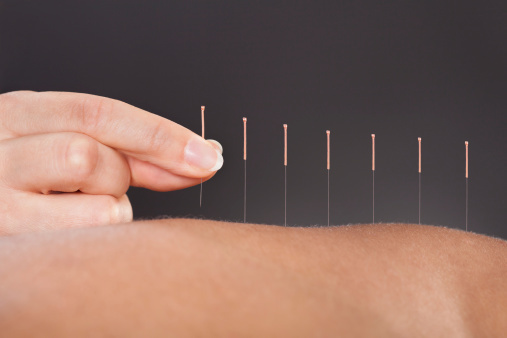 Western medical acupuncture is the modern approach to this, using the scientific knowledge and research we now have into how acupuncture works and how to use it to best effect to release the natural chemicals in your own pain-softening pharmacy. My focus is often on relaxing tight or shortened muscles that are often causing pain. This helps normalise the area. You may be aware of muscular "knots" or trigger points that hurt when pressed, These can be involved in many pain syndromes, even interfering with hormones and the internal organs. This particular acupuncture approach which has been shown to have great effectiveness in helping headaches and migraines. TMJ/ jaw and face pains may also be caused by tension and tightness in the muscles around the neck, shoulders, face and scalp. I often combine needling with cranial osteopathy and release techniques of the soft tissues inside the mouth. Medical research has shown acupuncture to be helpful with arthritic knee pain, headaches and migraines. In the area of women’s health, acupuncture can help treat pelvic pain (SPD), reducing blood sugar and improving hormonal balance in polycystic ovaries syndrome (PCOS). More and more people are coming for help with hot-flushes etc to help smooth their way through menopause. Professional help is at hand for pain, stress, physical and emotional health. Copyright Qi to Health 2018. For the practice Privacy Notice see the About page.